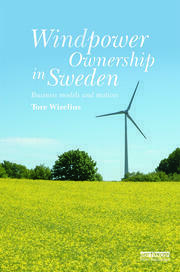 Tore Wizelius is a writer and journalist who has authored ten books on wind power, seven in Swedish, three in English. He was the Sweden correspondent for Windpower Monthly during the 1990's, a lecturer on wind power at Gotland University 1998 – 2008, and is now working as a windpower project developer in Sweden. Although I’m of mature age, my academic career has been very short. In 1997 I suggested to the extension Centre of the Royal Technical University (KTH) in Visby, Gotland, that they should develop some courses on windpower. They then asked me if I could do that, and I accepted. The extension center was then integrated into the newly established Gotland University where I stayed for some ten years, developing courses, mainly for distance education, first in Swedish and then also in English and teaching these courses as well. It started out as a side job, but in 2008 there were ten teachers employed to manage and teach ten different courses on windpower, focused not on technology, but on windpower project development, which by nature is an interdisciplinary topic, comprising technology, meteorology, economics, politics, law, management and communication. Since there was no university textbook on windpower, and my students needed one, I wrote the book Vindkraft i teori och praktik (Wizelius, 2003, 2007) in 2003, the third edition was published in 2015. The book was then translated and published in English in 2007, Developing Wind Power Projects (Wizelius, 2007. In 2014 my thesis from Lund Technical University, Windpower ownership in Sweden – Business models and motives, was published, followed by a new book on windpower project development; Windpower Projects – theory and practice, in 2015. My very first book, Ack, Värmeland du sköna – avfolkning och bolagsvälde i norra Värmland, was published in 1972. In English the title would be Oh, beautiful Värmland – depopulation and corporate power in northern Värmland (Jacobsson & Wizelius, 1972). This was originally a paper corresponding to a Master thesis (there were no master programs at Swedish universities at that time), in social anthropology. In retrospect I realized that the approach in this first book actually was very similar to the one I use in the windpower ownership book; a study of a socio-technical system, forestry, with ownership models as the important parameter (a comparison of local communities with forests owned by farmers versus forests owned by forestry companies), as well as the impact of new technology for mechanization of forestry on the ecological system, social structure, economy and local politics. After finishing my studies at Stockholm University I have been working as a journalist, most of the time as a freelance writer. Since I have been a devoted environmentalist since the 1960s, I specialized in topics related to environment and energy. I was engaged in the anti-nuclear movement, convinced that the risks of nuclear power where too high, which unfortunately has been confirmed by the accidents in Harrisburg, Chernobyl and Fukushima. However, to close down nuclear power plants, and replace GHG-emitting fossil fuel fired power plants, there has to be renewable energy sources which can replace them. I found it more rewarding to work for and promote solutions, than to criticize the energy policy of the government. Windpower is a renewable energy source, and I followed and wrote articles and reports on the development of windpower. As a spin-off I became an expert on this subject. I understood that when I made an interview with an engineer in charge of windpower at a very large Swedish power company and realized that he didn’t have even a basic understanding of windpower technology or wind meteorology. In the 1990s I was correspondent in Sweden for the international magazine Windpower Monthly. In the early 1990s I wrote my first books on windpower, Vind, del 1, Vind, del 2 and Vind, del 3. The idea was to have a yearbook on windpower development, but after three books the publisher gave up the idea. My fourth book on windpower, Vindkraft - en ny folkrörelse, (Windpower - a new people’s movement), was about windpower cooperatives, and was published in 1999. My interest in cooperatives also had a background. In the early 1980s my family became member of a nursery school cooperative in Stockholm. This was a rather new social invention at that time, there were only four such cooperatives in Sweden. Local politicians were not so fond of this, not until they realized that such cooperative child care operated by parents was in fact much cheaper for society than public nursery schools. Politics changed quickly, and today there are several nursery coops in all Swedish municipalities, there are thousands. While I still was member of one, when my kids still were kids, I wrote a manual on how to start such cooperatives, which helped other parents to follow in our footsteps. And there was a chain reaction, leading up to the thousands of parent-operated cooperatives that exist today. By writing this manual for windpower cooperatives, I hoped to start a similar social chain-reaction. During the 1990s I was also board member and secretary in the Swedish Windpower Association for several years, as well as editor for the association newsletter. As soon as I started to work at Gotland University, I left these assignments, since a university teacher should be unbiased and not be member of any lobby groups. After taking a leave from my job at Gotland University in 2008, I have devoted half of my time to writing and teaching. In 2010 I developed a master-course on Windpower Planning for landscape architects at the Swedish University of Agriculture at Alnarp outside Malmö and developed a package of distance education courses on windpower translated into Chinese and used for competence building in China, financed by the German technical cooperation agency GTZ. The other half of my time I have worked as a windpower project developer, i.e. I turned theory into practice. I started a number of windpower companies, like Boge Vindbruk AB, ReWind Offshore AB, developing near shore offshore wind farms with mixed public and private ownership, and Wind4shore AB, which develops a “on the rocks”-windfarm on rocks and small islands outside the now decommissioned Marviken power plant, which was built as a nuclear power plants in the 1950s, but never loaded and run on oil. Now it will be turned into a modern renewable windpower plant, connected to an empty 120 kV power line that become idle when Marviken power plant was closed down, taking the step from the stone age to the renewable future. And these projects now take all of my time…. Tore is a devoted environmentalist, and a bird watcher.